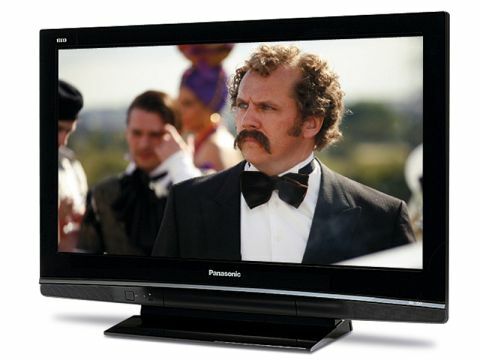 Aesthetically the Panasonic TH-37PX80 is a bit boring, truth be told, lacking the glossy glamour and slenderness of many of its rivals. But things look up with the discovery among its connections of three non v1.3 HDMI sockets, all capable of handling 1080p/24fps inputs, but not Deep Color compatible. There's a dedicated PC input too and an SD card slot for direct playback of digital photos. The 37PX80 offers a fairly modest 1,024 x 720-pixel resolution, and we hope the screen's V-Real 3 system will translate the UK's various 1,080-line HD sources to this resolution noiselessly, while boosting colour toning, motion handling and black levels. Unusually for a plasma, the 37PX80 also features 100Hz, there to increase the stability of the picture when things get moving, especially during camera pans or tracking shots. One thing is immediately apparent: plasma still rules the roost when it comes to black levels. None of the LCD rivals today get close to the profundity and richness of this screen's dark scenes. This immediately gives contrast-heavy films a greater feeling of consistency and, therefore, a more immersive quality. The profound black levels also help pictures generally look more dynamic, especially as the effortless nature of the black response means the set can still comfortably resolve plenty of the subtle shadow details that make dark scenes credible and three-dimensional. The 37PX80 also impresses with its much improved natural and vibrant colours. The effectivness of the V-Real 3 engine, meanwhile, is apparent in the quality of standard-definition pictures after being upscaled to fit the HD Ready panel resolution, and also in the sharpness of HD images given the limitations of the 1,024 x 720 pixel count. Motion, too, looks noticeably smoother and less 'juddersome' than on previous Panasonic plasmas, while the 37PX80's sound is far richer and more powerful than we'd expected. On the down side, some deep reds can end up looking slightly orange, and HD images don't look quite as pristine as they do on a good full HD TV.